When the onlooker recognises that the painting perhaps reminds them of a landscape but cannot quite put their finger on why, they usually ask the question 'where is it, where was it painted?' - this is because Adrian's practice isn't about topography or the conventional landscape; it's about the direct relationship between human presence and nature that is informed by recalled memories. It is this within this sense of palimpsest that he is most free to explore the ideas that resonate onto the canvas through colour, light and form. These four monumental pictures started out a few years ago when the artist was making 'plein air' images next to a small pond on the Island of Jersey. Many paintings and several exhibitions later this latest series ‘Apollo’s Eye’ has come about. 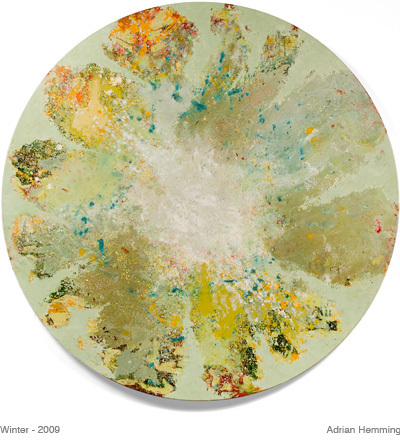 A companion series of four circular 1190mm diameter paintings entitled 'The Four Seasons' are to follow.